Krill is a very small shrimp-like zooplankton that feed on aglae in their billions throughout the world's oceans. Euphausiacea (commonly called 'Krill', which refers to the entire Euphausiacea family but can come from the Atlantic or Pacific in which the species are referred to as superba and pacifica, respectively) is a family of small sea creature (crustacean). It is one of the most abundant biomasses on the planet making it a highly sustainable and renewable source that produces very high quality Omega-3 (Eicosapentaenoic Acid, EPA, and Docosahexaenoic Acid, DHA) oils. The Omega-3's in Krill Oil are bound to phospholipids, allowing them to be absorbed faster (higher bioavailability and rate of absorption) and incorporated into cell membranes more effectively than Omega-3's from other fish oils. 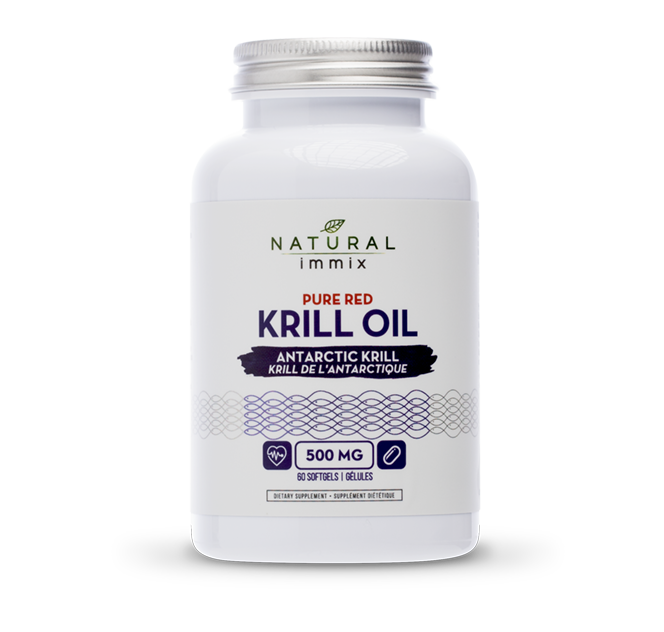 Krill Oil also has a very high antioxidant property due to its naturally occurring antioxidants vitamin A, vitamin E, and Astaxanthin. Astaxanthin is a red-orange pigment with powerful antioxidant capabilities that protect cells from oxidation by free radicals. Omega-3's are essential to human health but cannot be manufactured by the body. They are instead found in foods like fish that ingest krill and in supplements such as Natural immix Pure Red Krill Oil, which is sustainably harvested and produced using with a process that preserves the delicate Krill Oil’s natural properties and provides the same health benefits of Omega-3's from fish oil, but at a lower dose of EPA and DHA. Krill Oil fatty acids tend to be diacylglycerides (two fatty acids bound to a glycerol molecule) rather than triglycerides and due to binding to a phosphatidic acid group at the final binding site, the structure is a phospholipid in nature. Structurally, the fatty acids are bound in phospholipid form. While they confer the same benefits as the fatty acids, there are some differences in the absorption kinetics and the phospholipid itself may also be bioactive. Thousands of studies show the benefits of Omega-3 fatty acids for the heart and circulatory system however, many people do not get enough Omega-3 fatty acids in their diet. Two important Omega-3 fatty acids in Krill Oil that are absorbed and incorporated into cell membranes faster and more effectively than the same Omega-3's from other fish oils are Eicosapentanoic Acid (EPA) and Docosahexanoic Acid (DHA). Both of these fatty acids help reduce low density lipoproteins (LDL's) and raise levels of good high density lipoproteins (HDL's). These nutrients also reduce blood vessel constriction, lower fibrinogen (the blood clotting factor), and keep platelets from becoming too sticky. EPA (Eicosapentanoic Acid): is one of several Omega-3 fatty acids used by the body that is found in Krill Oil. Omega-3 fatty acids are part of a healthy diet that helps lower risk of heart disease. Getting more EPA in your diet has positive effects on coronary heart disease, high triglycerides (fats in the blood), high blood pressure, and inflammation. DHA (Docosahexanoic Acid): is another essential Omega-3 fatty acid found in Krill Oil. Your body needs DHA for the proper functioning of your brain as an adult, and for the development of your nervous system and visual abilities during the first 6 months of life. In addition, Omega-3 fatty acids are part of a healthy diet that helps lower risk of heart disease. Our bodies naturally produce small amounts of DHA, but we must get the full amounts we need from our diet or supplements. Phospholipids: make up an important class of lipids for the construction of cell membranes. The Omega-3's in Krill Oil are bound to phospholipids, allowing them to be absorbed faster and incorporated into cell membranes more effectively than Omega-3's from other fish oils. Esterified Astaxanthin: is often referred to as ‘the King of carotenoids.’ Astaxanthin belongs to this class of naturally-occurring antioxidants and is responsible for the orange/red colour of wild salmon oil. Astaxanthin is found in the highest concentration in krill and the muscles of wild salmon and is one of the most powerful compounds in our health arsenal with antioxidant effects more than 65 times stronger than vitamin C, 50 times more powerful than beta-carotene, and 10 times more powerful than vitamin E.